Kernels demand sugars. Developing corn kernels place a very high demand on the plant for sugars. Stress reduces the rate of photosynthesis, thereby reducing the amount of sugars that the plant is able to produce. Many different stresses can reduce the rate of photosynthesis: too much or too little moisture, nutrient imbalances, plant injury (ex. : hail, insects, diseases), excessive plant populations, and even long-periods of cloudy weather. In northwest Minnesota in 2018 these stresses included higher than average temperatures and lower than average rainfall during much of the grain-fill period. Stalk rots. If the plant is unable to keep up with kernel sugar demand, the plant can rob sugars from stalk tissue, predisposing it to stalk rots. Corn plants are top-heavy and stalk rots increase the chances that plants will fall over (lodge) due to either gravity or wind and other weather events. Pinch or push test. 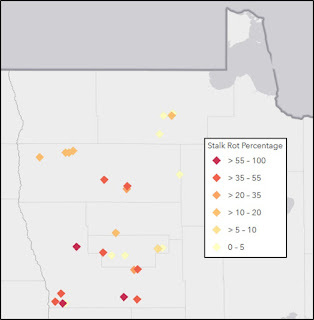 To better understand how much stalk rot might be present in a given field it is recommend that each field is scouted in one of two ways, by pinching or pushing plants. Regardless of the test, walk each field in a zig-zag pattern, checking 20 random plants from 5 spots in the field. For the pinch test, pinch stalks toward the base, below the lowest node, checking for firmness. For the push test, hold your arm out from your body and push the plant to see if the stalk bends or breaks. With either test, there is a significant lodging potential if 10 to 15% of the plants fail your particular test. Triaging harvest. Pinch or push-testing your fields can help in prioritizing which fields need to be harvested first to avoid having to harvest lodged corn. Specialized reel-systems have been designed to better salvage downed corn but as most don’t own such an implement general harvest recommendations include: slow drive speeds and harvesting against the grain. 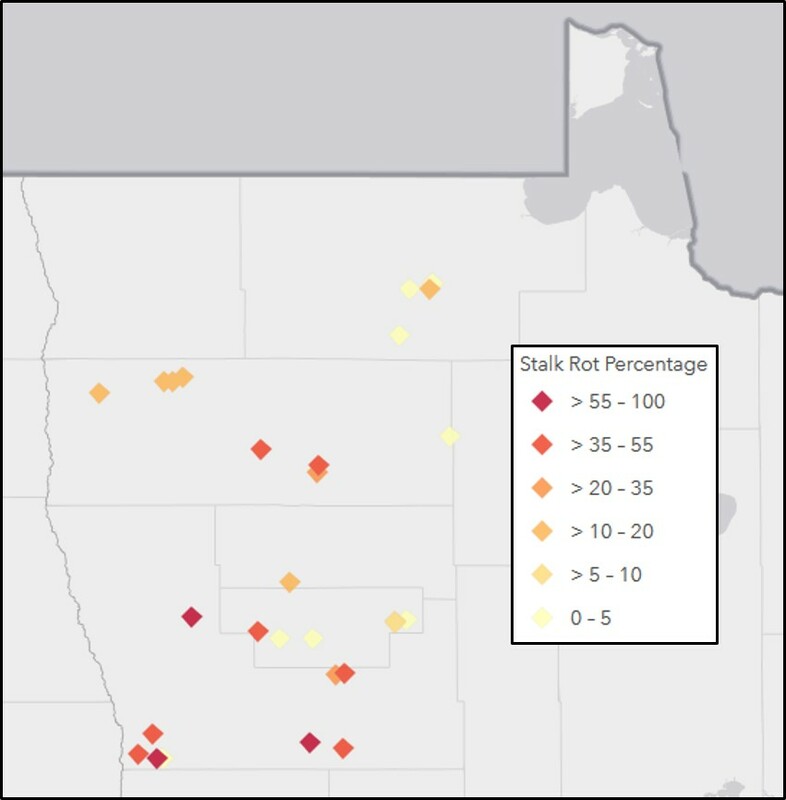 Results of a 2018 corn survey. A corn survey took place a couple of weeks ago in fields throughout NW MN. An abbreviated version of the push test was done with 20 instead of 100 plants at each field location included in a state-wide European corn borer survey (Figure). Figure. Results of an abbreviated push-test in fields surveyed in northwest Minnesota in 2018. While in one field every plant failed the push test, stalks held up remarkably well in many of the fields (Figure). There is a significant risk of lodging in more than half of the fields surveyed. The one larger lesson from this survey is that with different corn hybrids, soil types and environmental conditions in northwest Minnesota: no generalized regional survey can stand in for surveying individual fields.